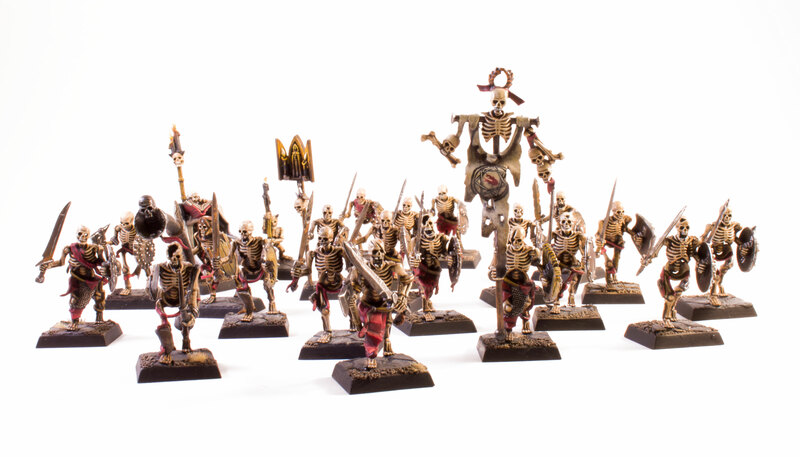 Shambling from their tombs this week, a rotting regiment of Blanchitsu inspired skeletons. I’m fascinated by the way symbols can be misappropriated and subverted. Born from a love of Mordheim: City of the Damned, these miniatures are covered in the rich symbolism that defines the world of Warhammer. 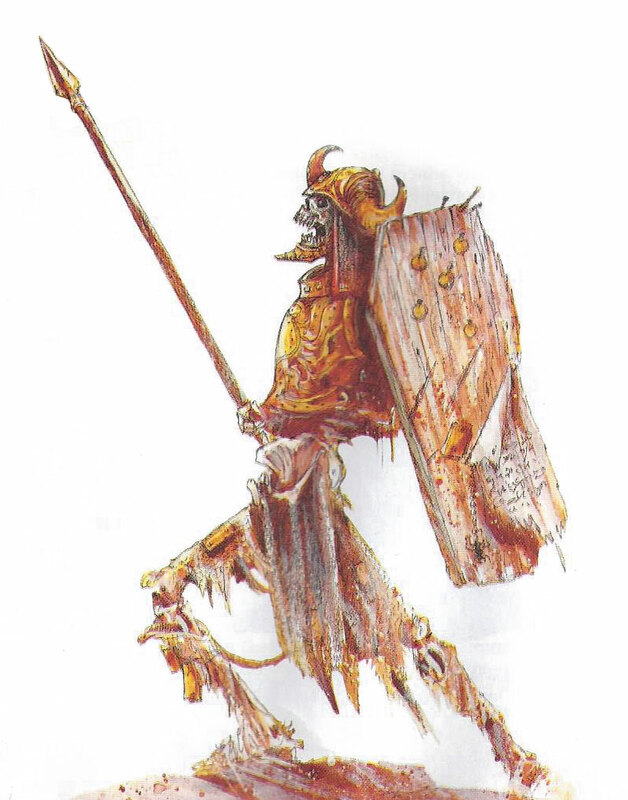 Skeleton Warrior by John Blanche from White Dwarf 338 March 2008 © Games Workshop – used without permission. Once again I’ve used a restricted palette and initially sketchy painting style to evoke the qualities of John Blanche’s artwork in my miniatures. I’ve used the twin-tailed comet device but is it a desecrated holy Sigmarite symbol, an esoteric icon of power or does it symbolise something more nefarious altogether (maybe the fallen Be’lakor, the Dark Master himself)? I’ve left it deliberately ambiguous. 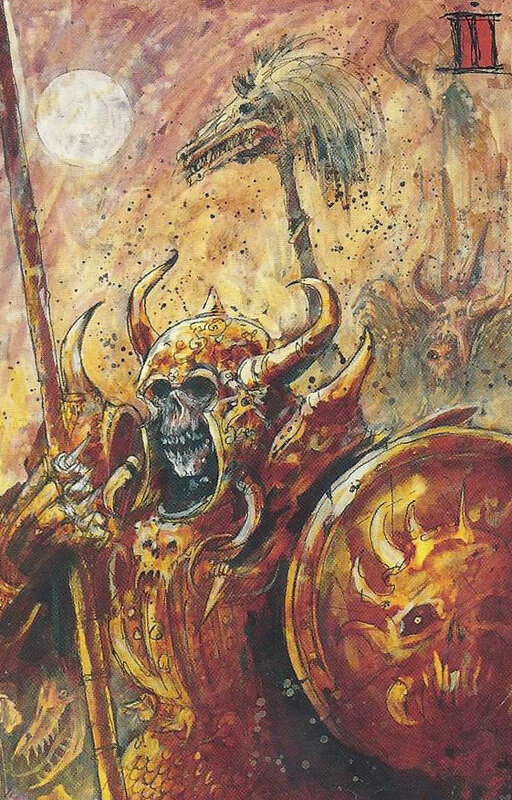 Perhaps in different times it has meant all of these things – its meaning as transient as the tides of power in the Mortal Realms. In my research I looked at lots of esoteric symbols and seals to create the freehand design on the banner. The septagram or heptagram is a seven-pointed star which over the centuries has become an occult symbol associated with synthesis. However I mainly chose it because it looked cool and more interesting to paint than a pentagram. I also painted one in the necromancer’s grimoire to form a deliberate link between these two objects of power. 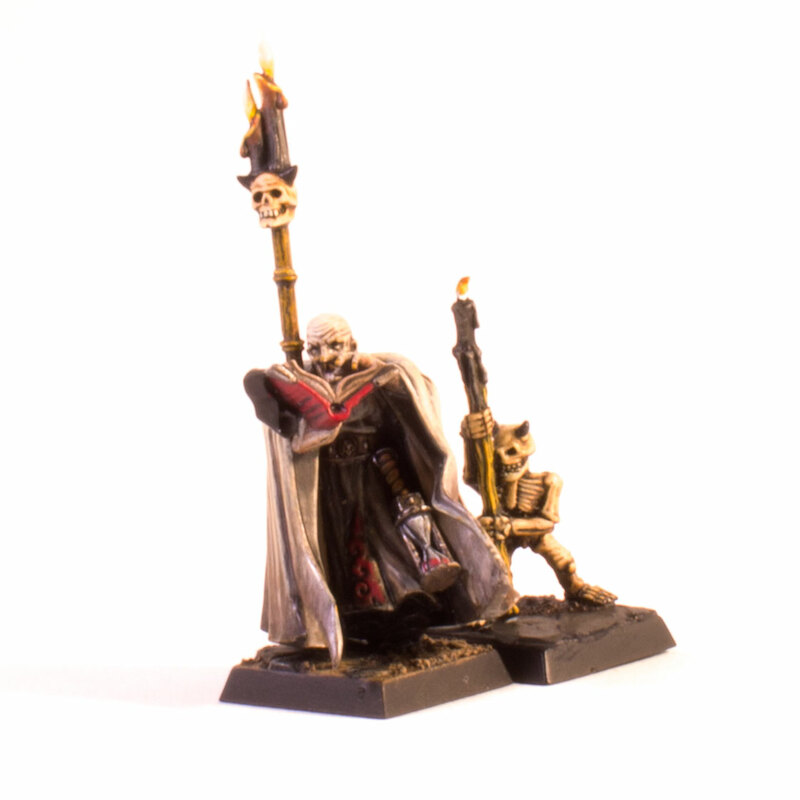 The necromancer was actually the first model I painted for this army. He was converted from an Empire wizard with a flagellant head as it looks so craven and sinister. 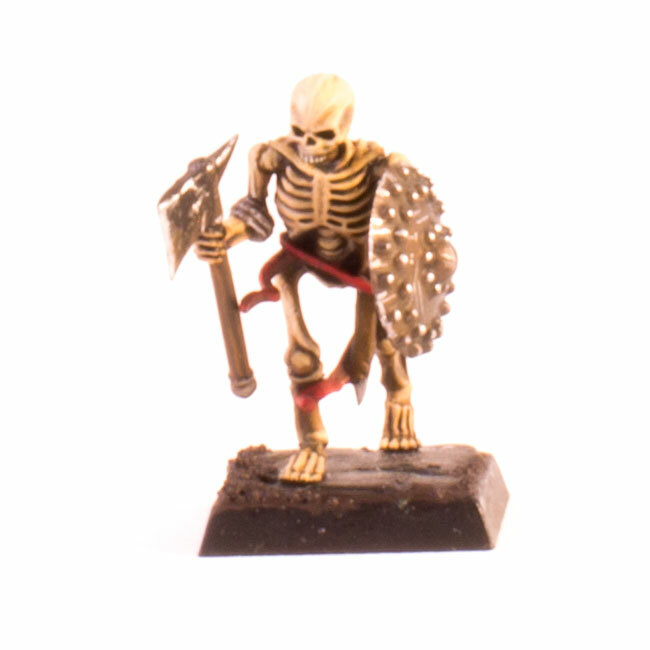 He’s one of my favourite miniatures in the army especially as he gives me a great excuse to use the classic Chaos skeletal familiar (still work in progress). I’ve gone with black séance candles on these two and the unit icon bearer. For the object light-sourcing I followed the guide in an old White Dwarf and looked at lots of pictures of candles online to note how the flame burns. A candle flame tends to be yellow/white and doesn’t have the same properties as a fire or burning torch. One of my favourite things about Warhammer and Age of Sigmar is the gothic vibe and I’ve added little memento moris such as hour glasses, skulls and withering roses. I used an autumnal laurel wreath as another small theme on the banner top and hanging from the champion’s belt. It’s a symbol of decaying imperialism and the transience of power. I wanted this unit to look ragtag and only used unhelmeted heads. Although skulls all look the same, I tried very hard not to repeat too many of the same parts so picked up skulls from all over the range. 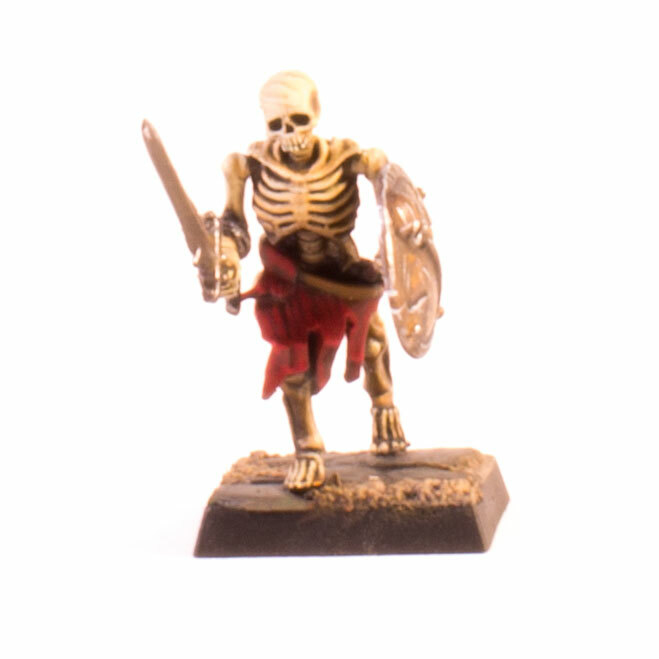 For instance the Champion head is from the Crypt Ghoul kit. 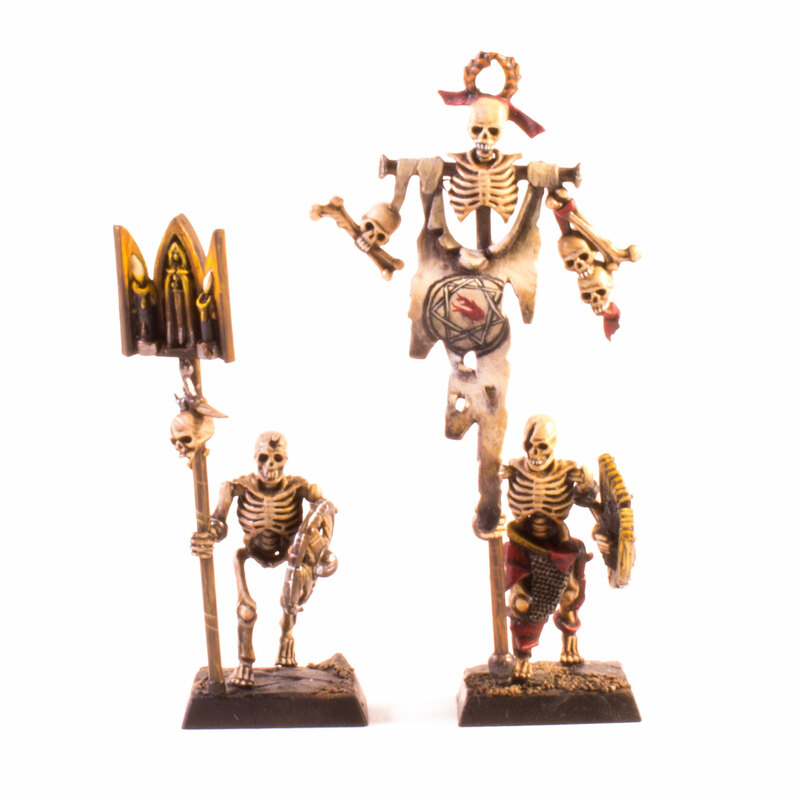 For fun I also used an angry skull and a sad skull from one of my brother’s spare Chaos Marauder horsemen banners. Bestial Brown, Bestial Brown/Bubonic Brown 1:1 drybrush. Scorched Brown then Bestial Brown then Bestial Brown and Bubonic Brown 1:1. As ever, drop us a comment if you like what you see. ‘Till next time! This entry was posted in Armies on Parade, Showcase, Tim Price and tagged #warmongers, Age of Sigmar, Blanchitsu, Freehand, John Blanche, Skeletons, Technasma, Undead, Warhammer. Bookmark the permalink. Both the design and the painting are brilliant.